And Central Bankers’ worse enemy? Gold. Although it may sound provocative, I believe that macro economists and strategists need to pay more attention at the different elements of Money Illusion in our Global Financial System, analyze them, exchange views and prepare potential scenarios. This research report is a humble contribution to foster more discussion on this subject. 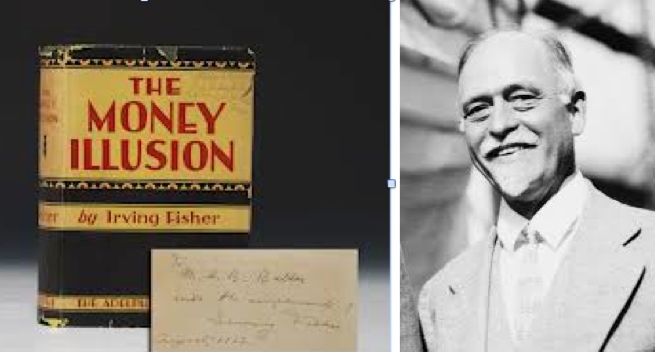 Macro-economically and monetarily the concept of collective Money Illusion was best coined by Professor Irving Fisher, one of the leading founding fathers of the U.S. FED. This was more than 100 years ago. Having studied Prof. Fisher’s academic work in the Neoclassical Monetary Context he wrote in, I suggest following definition of Money Illusion: Economic agents are not always aware of the loss or rise in the (intrinsic) value of the currency they hold. This can be random or systematic. I wished more economists would study the analysis of the founding fathers of the current central bank system. The book Money Illusion by Prof. Irving Fisher is a must for all those concerned with the current monetary system’s stability. In my personal analysis Money Illusion is widespread today, but necessary from Policy Makers’ point of view. It helps maintain the stability of our fragile Financial System – at a time when multiple crises and tensions call for bold responses by Western nations and policy makers, it is worthwhile to explore Money Illusion. An example: As politicians in Europe and America have so far only enacted quick fixes, the USD and the Euro (and even the Yen) may be prone to renewed depreciation pressures, lifting the Swiss Franc along. Thus it is not so much an appreciation of the Swiss Franc (or of Gold for that matter) that we are witnessing, but a long-overdue depreciation of major paper currencies. Since the end of the Gold Standard there is no way of officially measuring the direct value of a paper currency, except against another paper currency. This means that US Dollars are measured in Euros and Yen. And vice-versa. Mathematically – given trading volumes – they cannot go down simultaneously. A collapse of the Euro would see a rising demand for USD and possibly YEN, GBP and Swiss Francs. So the Swiss Franc is a marginal beneficiary of outflows in one of the major currencies. Since most major central banks have printed gigantic amounts of paper money over the past 20-30 years, none of the paper currencies has utterly collapsed. Debased USD are measured in debased Euros. Debased Yen are measured in debased USD and Euros, and so on. Remember, the SNB was finally forced also to allow a massive monetary expansion in order to contain the appreciation of the Swiss Franc. This superficial stability of Currency Exchanges coupled with the government-sanctioned focus on CPI inflation feeds the Money Illusion. Our paper currencies have no systematic way of being valued even as their inherent value has been debased by the money printing. The only serious threat to Policy Makers stems currently from Gold – but as I have told many times to those putting all their savings in gold: “be careful, most gold-buyers buy it for the wrong reasons and you have all major governments, central banks, supranational institutions and the financial industry against you”. Gold is the Central Banks’ worse enemy, therefore you should have a decent exposure to gold, but not too much. Consequently, major banks whose survival is closely linked to central banks’ credibility view GOLD as their arch enemy too. Central banks and big banks will therefore do whatever they can to keep the price of gold from rising. A rising price of gold is probably the only credible indicator to most citizens that the paper-money they hold in their wallets is getting worthless. In fact it is not so much gold that is rising in value, it is the value of paper money that is fading away. Yes, the real Gold Price Rally is still ahead of us, but we may see it really taking off only once central banks have replenished their gold reserves. Which they will not fully show, yet. Another reason why policy makers refuse to have their gold reserves and the CPI statistics independently audited. I personally don’t trust CPI statistics, Money Supply nor Gold reserves. The same government printing gigantic amounts of paper money, tells me that its value is stable, inflation is almost zero, gold reserves are only rising modestly and that gold is a bad investment. An amazing setting of conflicts of interest. Unfortunately too many gold investors are too sure about their case for gold – and I found most of them share in the Money Illusion they so criticize in the system. Let me give an example: As long as gold-investors think that a price increase of gold from say USD 1’500 per ounce to USD 2’000 is an appreciation of gold itself, even gold-investors might be part of the Collective Money Illusion. The day that investors realize the gold price increase reflects merely the loss in value of the USD, people all over the world will begin to question the stability (inherent value) of their paper currency. That helps explain why expert teams at leading institutions are drawing plans for an International Monetary Reform. Ultimately Policy Makers will fail to convince their citizens that the shier overspending and printing of money of the past 20-30 years has not changed the intrinsic stability and value of their paper money. The value of paper currency might be stable, but the system has become highly unstable. My point is that a currency reform is coming. The illusion that as long as CPI is muted, there is no problem, is something that may appease financial professionals and intellectual minds, but not the man on the street. The latter relies on his common sense. Disclaimer: This is a personal opinion stemming from my personal research. No person should interpret it as a recommendation to buy or sell any asset mentioned here. People should be careful with money investments and get professional advise before making any investment decisions. GLOBAL RISK MONITORING reaches critical threshold. One of 15 factors is Geophysics: USA at risk?